Today I present to you a two for one outing idea! Don’t you feel lucky? 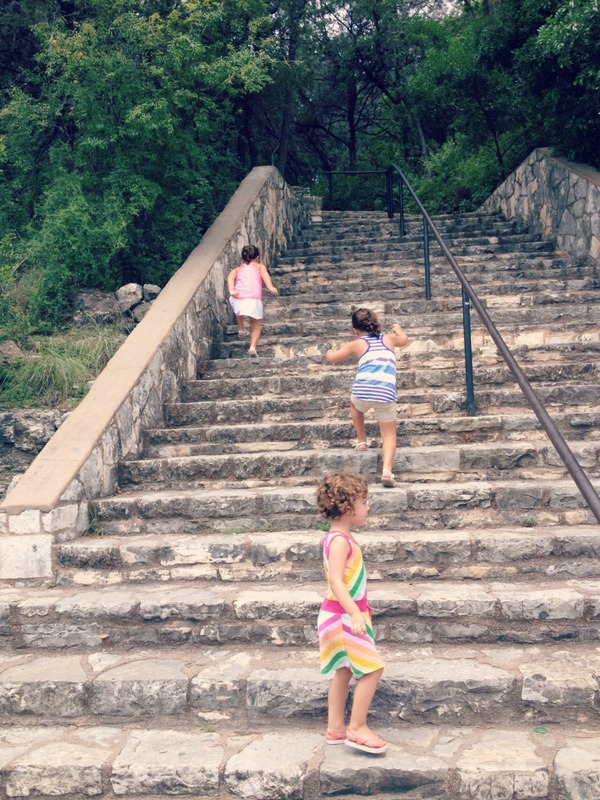 This week we headed to Mayfield Park for our adventure, then skipped over to Mount Bonnell for a climb. Mayfield Park (3505 W. 35th St) is one of my favorite places to visit when we need a little something different to do. 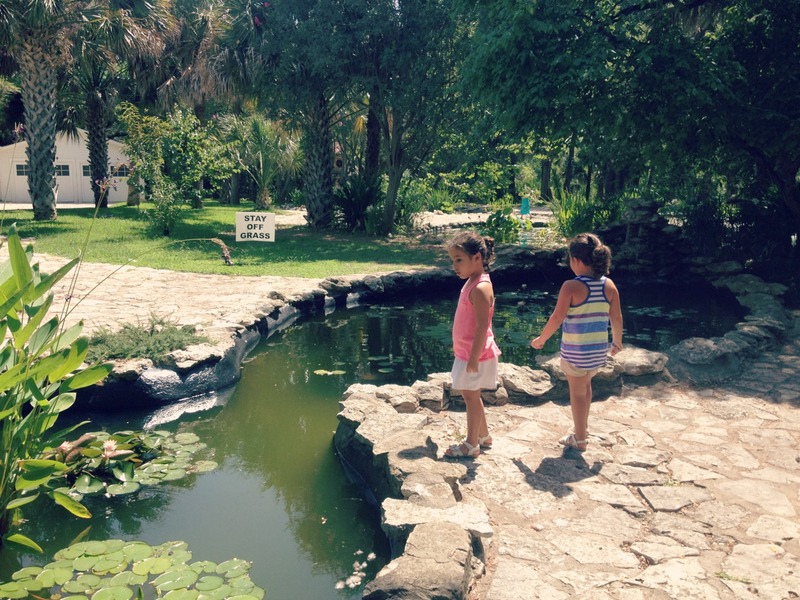 Open to the public and maintained by the Austin Parks and Recreation, Mayfield Park features festive gardens, tranquil ponds, scenic trails, lush lawns, and beautiful, historic structures. 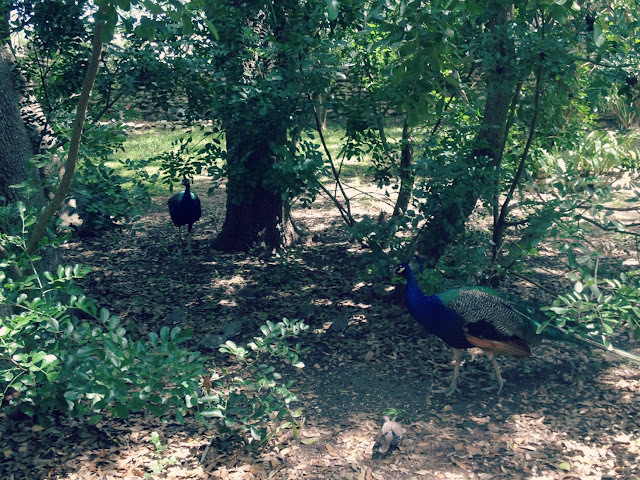 And peacocks! 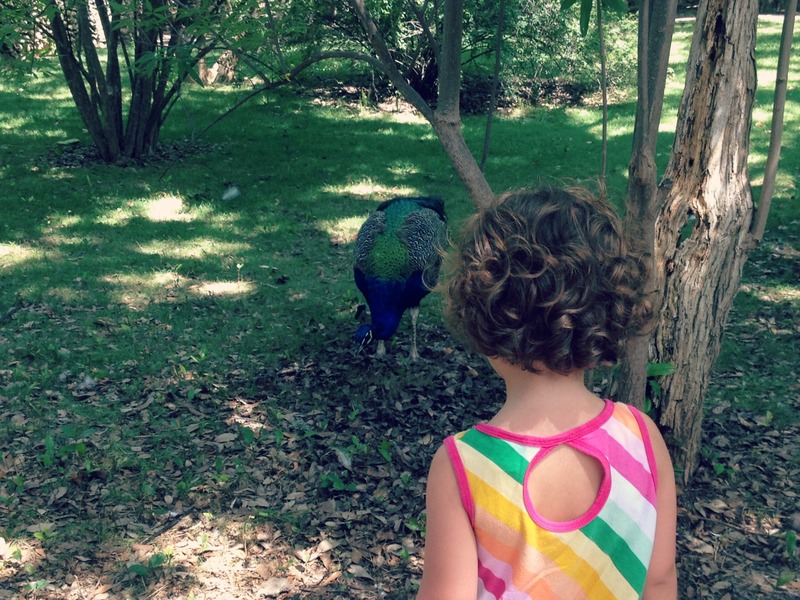 The peacocks are definitely the highlight of Mayfield Park, at least for kids. They roam the grounds freely, dotting the trees and strutting around the lawns, their calls echoing throughout the park and giving guests a thrill. I did a little (and I do mean little) research on Mayfield Park, and found out that the 23 acres of land was originally purchased in 1909 by Allison Mayfield for his family as a summer home. Allison’s daughter Mary moved into the cottage with her husband in 1922, adding onto the house and designing the gardens, ponds, and water features. 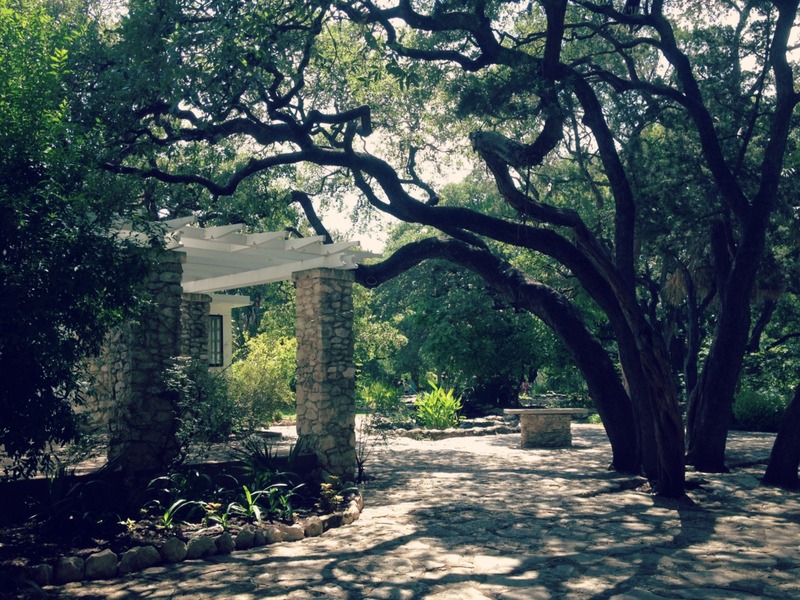 Mary died in 1972, leaving the land to the city, and since then, the Austin Parks and Recreation Department has worked to maintain and restore the structures and gardens to its original glory. I’d say they’re doing a good job. Stone walking paths wind themselves around the gardens and the ponds, which are chock full of lily pads, lotus flowers, and large koi fish if you keep an eye out. The park is very well shaded, which was a great relief on this hot day. Most of the peacocks were perched in the trees, but we finally found a good number of them wandering around the north side of the cottage. Spring time is by far the best time to visit Mayfield Park if you’re looking to get a good plumage show from the peacocks. They show off those feathers left and right during mating season. On this hot summer day, we didn’t get any good feather views. 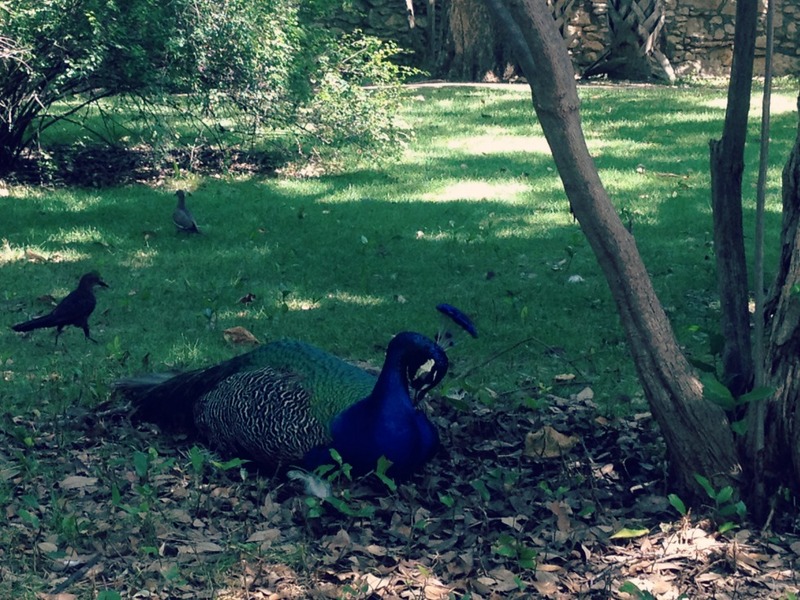 In fact it looked like the peacocks were molting. But they were still as beautiful and majestic as ever. After lunch on the picnic tables near the park entrance, we headed to Mount Bonnell (3800 Mount Bonnell Rd). Mount Bonnell Road actually dead ends at Mayfield Park, so it’s just a short drive. 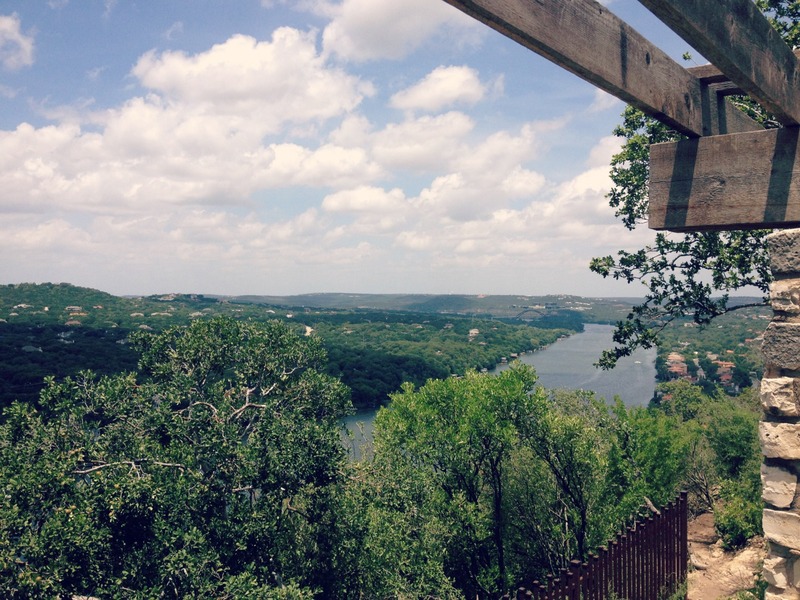 Mount Bonnell is one of the highest points in the city, and said to be Austin’s oldest tourist attraction. The entrance to the steps leading up to Mount Bonnell is right off Mount Bonnell Road. There’s ample parking along both sides of the road, but watch out for cars, especially with little ones. I was kind of afraid my girls, ages 5, 5, and 3, would balk at the number of stairs involved, but they were super excited to “climb a mountain.” Turns out it wasn’t that bad at all. They reached the top in no time, and we took in the breathtaking views of the river and surrounding land. Mount Bonnell served as part of the defense of Austin from Native Americans and the Mexican Army in the early 1800s. 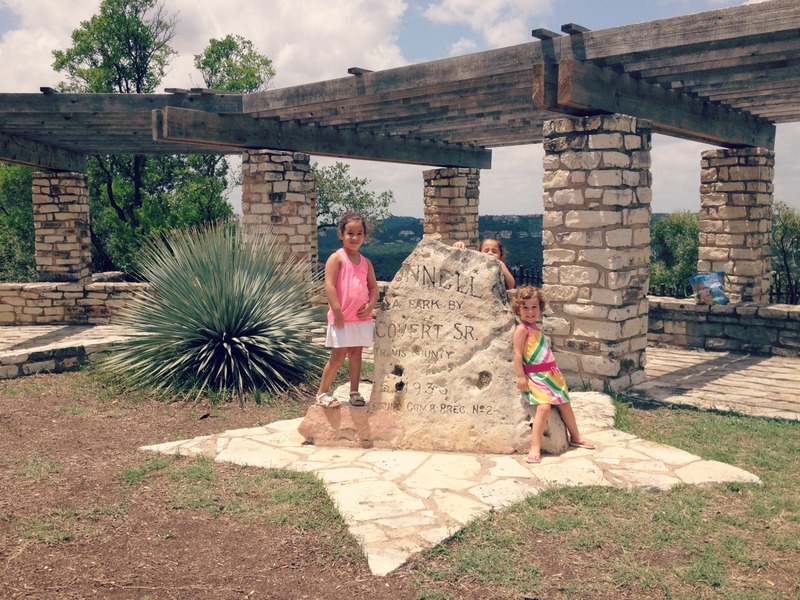 The 5.36 acre city park at the top of Mount Bonnell was named Covert Park in honor of Frank M. Covert, Sr. 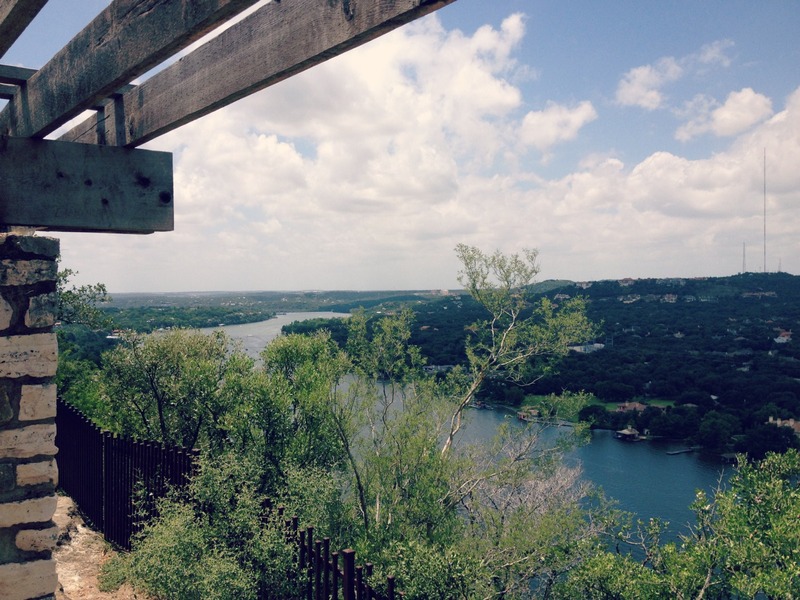 There are several speculations as to where the name Mount Bonnell came from, but no one is quite sure. Trails lead off of either side of the landing at the top of the stairs, but they don’t seem to go anywhere far. Unfortunately we weren’t able to venture too far, and soon enough it was time to head back down the mountain. We went home and gorged our sweaty selves on popsicles. There are no real bathrooms at Mayfield Park. There is a porta potty; however, while we were waiting, a woman came out and said it was pretty nasty. We opted to drive to the Randall’s on 35th for a bathroom break before heading to Mount Bonnell. If you’re looking for another idea, Laguna Gloria is just down the road from Mayfield Park. Unfortunately, this was a Monday, and they were closed. 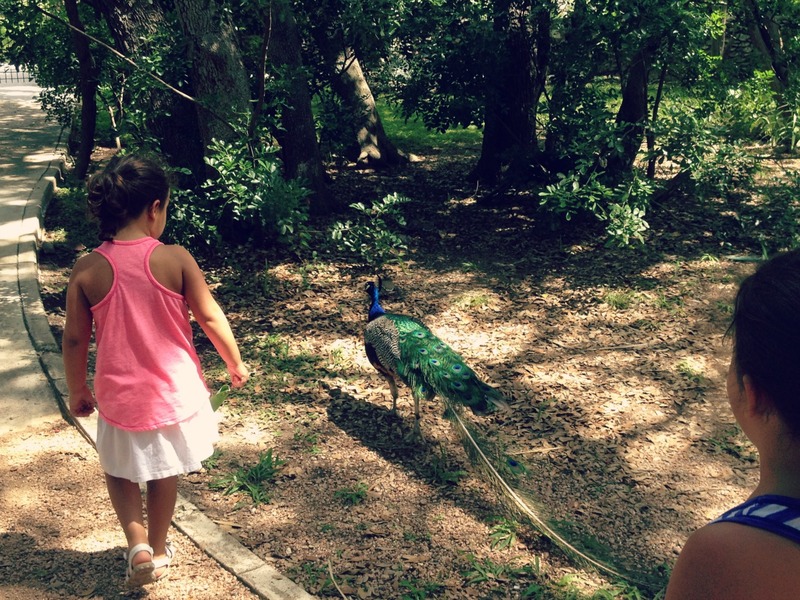 Mayfield Park is one of Austin’s most popular spots for family photos and bridal portraits. Professional photographers wishing to use the grounds must book in advance with PARD at 512-974-6797. Mayfield Park is also a great place for a little hike. Short trails wind from the grounds down to the river and back. It’s perfect for a morning or afternoon walk. The stone steps leading up to Mount Bonnell can be rather slippery. Use the handrail to avoid slipping. Mount Bonnell also has a few picnic tables for visitors. Otherwise, stone half walls can serve as seating as well.